Artyface Community Art are delighted to announce an ongoing sponsorship by Fired Earth of our school projects through donations of Fired Earth tiles. We are proud to have Fired Earth supporting us and the communities we work with. Our aim at Fired Earth has always been to distil our essential core values; Craftsmanship, Originality, Creativity, Authenticity and Inspiration. Fired Earth is pleased to be able to support Artyface projects which reflect these values in an educational and community context. As part of its ongoing support for a wide variety of community projects, Fired Earth recently donated two pallets of tiles to Artyface. 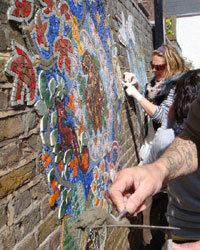 Artyface have been working with schools in inner-city London for eleven years, helping pupils to create spectacular mosaic murals for spaces such as parks, playgrounds and stairwells. As well as enhancing their surroundings with splashes of colour and imaginative designs, the murals give children an invaluable opportunity to get involved in every stage of the design and making process. As Artyface founder Maud Milton explains, "It will be really exciting for schools to get the chance to use these beautiful materials. We want to introduce children to the best materials and craftsmanship, so the support of Fired Earth is fantastic news." 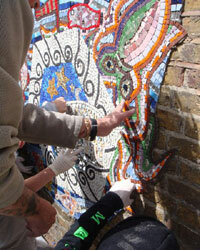 Artyface will be putting its consignment of broken and discontinued tiles to good use in projects in Tower Hamlets and Chelsea then in Haringay and Camden this year. 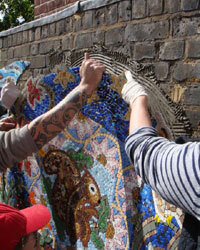 With existing designs including everything from peacocks to polar bears, and decorative bollards to incredibly detailed friezes, there's no knowing what the tiles will be transformed into but the results are guaranteed to be truly inspiring. For further information on the Fired Earth product range please telephone 0845 366 0400, email enquiries@firedearth.com or visit Fired Earth online at www.firedearth.com (opens in new window/tab).